On 23 March 2012, our all-sky imager recorded a concentric, ring-like gravity wave pattern. The wave arose within the area covered by images of both OH and O(1S) nightglow emissions taken at the Andes Lidar Observatory (ALO), Chile (30.3ÁS, 70.7ÁW). We have estimated the observed and intrinsic parameters of the event and located the wave source within the lower mesosphere altitude range using a reverse ray tracing method. By the analysis of GOES and LIS satellite images, we have not found evidence of neither convective nor lightning activity nearby ALO, indicating that the source of the ring-like wave was not directly in the troposphere. 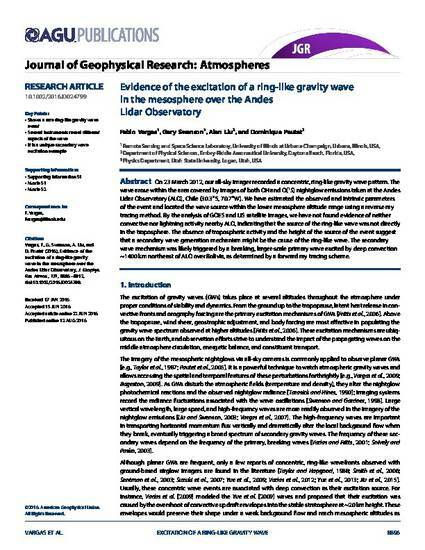 The absence of tropospheric activity and the height of the source of the event suggest that a secondary wave generation mechanism might be the cause of the ring-like wave. The secondary wave mechanism was likely triggered by a breaking, larger-scale primary wave excited by deep convection _1400ækm northeast of ALO over Bolivia, as determined by a forward ray tracing scheme. ©2016. American Geophysical Union. All Rights Reserved.